This article is about the city of Shawnee, Kansas. For the county with the same name, see Shawnee County, Kansas. Shawnee /ʃɔːˈniː/ is a city in Johnson County, Kansas, United States. As of the 2010 census, the city population was 62,209. Shawnee is located at 39°0′46″N 94°45′57″W﻿ / ﻿39.01278°N 94.76583°W﻿ / 39.01278; -94.76583 (39.012767, -94.765818). According to the United States Census Bureau, the city has a total area of 42.86 square miles (111.01 km2), of which, 41.85 square miles (108.39 km2) is land and 1.01 square miles (2.62 km2) is water. Shawnee Mission Park is a 1,600-acre (6.5 km2) park that includes a 120-acre (0.49 km2) lake. Shawnee is the 7th largest city in the Kansas City Metropolitan Area.. According to the 2007-2009 American Community Survey (2) the median income for a household in the city was $71,705, and the median income for a family was $86,408. Males had a median income of $55,222 versus $41,960 for females. The per capita income for the city was $33,502. About 3.6% of families and 5.7% of the population were below the poverty line, including 6.0% of those under age 18 and 4.8% of those age 65 or over. As of the census of 2010, there were 62,209 people, 23,651 households, and 16,876 families residing in the city. The population density was 1,463.7 people per square mile (564.4/km²). There were 24,954 housing units at an average density of 587.1 per square mile (226.4/km²). The racial makeup of the city was 86.3% White, 5.3% African American, 0.4% Native American, 3.0% Asian, 0.1% Pacific Islander, 2.3% from other races, and 2.6% from two or more races. Hispanic or Latino of any race were 7.5% of the population. There were 23,651 households of which 36.8% had children under the age of 18 living with them, 57.7% were married couples living together, 9.8% had a female householder with no husband present, and 28.6% were non-families. 23.1% of all households were made up of individuals and 6.0% had someone living alone who was 65 years of age or older. The average household size was 2.61 and the average family size was 3.11 persons. In the city, the population was spread out with 27.7% under the age of 18, 6.9% from 18 to 24, 28.7% from 25 to 44, 26.6% from 45 to 64, and 10.1% who were 65 years of age or older. The median age was 36.4 years. For every 100 females, there were 97.8 males. For every 100 females age 18 and over, there were 95.8 males. Shawnee has a council–manager government. Mayor and councilmembers are elected to four year terms. Each ward has two representatives whose terms are staggered by two years. However, the elections of April 2010 and 2012 will serve for three years. The day-to-day operations are managed by the city manager. A branch of the Johnson County Library serves the Shawnee mission area. The Library includes 13 locations throughout Johnson County, including the Shawnee Library. Shawnee Town 1929 Museum and Wonderscope Children's Museum are also located within the city. Shawnee is in the Kansas City, Missouri television market. The Shawnee Dispatch was a weekly newspaper published by the Lawrence Journal-World and The World Company. The Shawnee Dispatch ceased operation in November 2018.
Notable individuals who were born in and/or have lived in Shawnee include energy executive Linda Cook, former Attorney General of Kansas Phill Kline, comedian Chris Porter. ^ a b "City and Town Population Totals: 2010-2017". Retrieved March 8, 2019. ^ "2010 City Population and Housing Occupancy Status". U.S. Census Bureau. Retrieved March 6, 2011. ^ Blackmar, Frank Wilson (1912). Kansas: A Cyclopedia of State History, Volume 2. Standard Publishing Company. p. 682. ^ "Best places to live". CNN. Retrieved 10 December 2010. ^ "Shawnee Mission Park". jcprd.com. Retrieved 10 December 2010. ^ United States Census Bureau. "Census of Population and Housing". Retrieved November 29, 2014. ^ "Comprehensive Annual Financial Report City of Shawnee, Kansas Year Ended December 31, 2015" (PDF). Retrieved February 27, 2017. ^ "City Government homepage". Retrieved 10 December 2010. ^ "This is a test page....for maintaining redirects into our new web world". Retrieved 10 December 2010. ^ "Old Shawnee Town Museum homepage". ^ "the Shanwee Dispatch homepage". Retrieved 10 January 2014. ^ Chazan, Guy (2008-11-20). "Linda Cook - Executive Director, Gas & Power, ROYAL DUTCH SHELL". The 50 Women to Watch 2008. The Wall Street Journal. Retrieved 2016-01-21. ^ Mann, Fred (October 8, 2006). "Family, past shape Kline's efforts as attorney general," Wichita Eagle. ^ "Chris Porter Bio". MTV.com. Retrieved 2016-01-21. 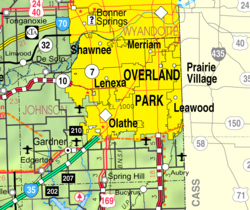 Wikimedia Commons has media related to Shawnee, Kansas.